888 Boylston Street -- Boston Properties Inc.
888 Boylston Street — Boston Properties Inc.
Once an actual bay before a 19th-century infill project, Boston’s Back Bay is a neighborhood known for its Victorian brownstones and the Renaissance-style Boston Public Library. Back Bay features a unique blend of older buildings and new construction including the Prudential Center and Hynes Convention Center, but a new office tower has not been built in the neighborhood since the 36-story 111 Huntington Ave. building was erected in 2001. All of that will change this summer as Boston Properties Inc., the same development company that brought 111 Huntington Ave., unveils its newest project: 888 Boylston Street. 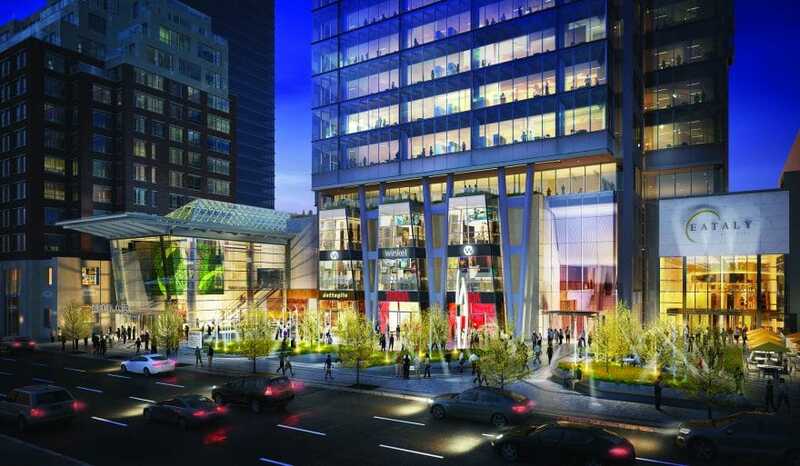 The final project in Boston Properties’ Prudential Center Master Plan, the 17-story, 425,000-square-foot tower will house 365,000 square feet of office space and 60,000 square feet of retail space and act as the new home of anchor tenant Natixis Global Asset Management, which will occupy more than one-third of the building. Slated for completion in summer 2016, 888 Boylston Street is expected to be LEED Platinum-certified and will be one of the most sustainable speculative office buildings in New England featuring a cutting-edge chilled beam system that circulates 100-percent fresh air throughout the building. A popular cooling technique used in Europe for decades, chilled beams are ceiling-mounted units resembling lighting fixtures that provide cooling using water rather than air. Water is cooled by a chilling system to between 55 and 65 degrees and pumped to heat exchangers or “beams” suspended from the ceiling. Chilled beams have the potential to increase energy savings by 20 to 50-percent depending on climate and building layout and are also quieter than traditional cooling methods. Furthermore, chilled beam systems provide for better air quality than traditional cooling systems. Other sustainable design features include 14 roof-mounted wind turbines and an expansive solar array that will combine to produce 134 kW of power. 888 Boylston Street will also feature a green roof with native plants and beehive colonies, two outdoor terraces for building tenants, energy-efficient outdoor lighting, a rainwater harvesting system, a high-performance building envelope and a living “green wall” in the lobby. Construction began on 888 Boylston Street in August 2014 with completion slated for July 2016. While New England’s long and harsh cold season makes construction difficult even in the best circumstances, Boston’s historically snowy winter of 2014/2015 saw a record-setting 110 inches fall upon the city. “Last winter was a challenge and we lost the entire month of February, but this is a schedule-driven organization and we’re still on track to deliver on time,” says Stewart. Boston Properties is one of the country’s largest developers of Class A office properties with a significant presence in four major metropolitan markets including San Francisco, New York, Boston and Washington, D.C. Founded in 1970, the self-managed and self-administrated real estate investment trust is headquartered in Boston. In 2010, the company bought the city’s John Hancock Tower, now known as 200 Clarendon Street, the tallest building in both Boston and New England. Boston Properties completed the 2.5-million-square-foot redevelopment of the neighboring Prudential Center and recently finished the 31-story Atlantic Wharf on Boston’s historic waterfront. Building in the densely-packed Back Bay neighborhood presented additional challenges for Boston Properties and the project’s general contractor, Turner Construction Company, a Boston-based firm with full-service estimating and value-engineering capabilities. Located in a densely-packed stretch of Boylston Street with the Hynes Convention Center to one side, the entrance to the Prudential Center on the other and the Massachusetts Turnpike snaking behind the building, crews were constrained to a relatively small footprint, making the construction balance a feat of planning and site management. “Between the consultants and contractors we hire, we had the right people to overcome those constraints,” says Stewart. Turner completed the project under a guaranteed maximum price contract, ensuring that 888 Boylston Street stuck to budget. With a litany of sustainable features, a central location and an experienced developer at the helm, 888 Boylston Street is sure to become an iconic feature of the Boston skyline in no time.